The next generation AirPouch® FastWrap™ is the industry’s most flexible, reliable and user-friendly on-demand protective packaging system. The FastWrap system produces filled bubbles and tubes used for wrapping, interleaving and block-and-brace applications. FastWrap secures and cushions your products while in transit, reducing returns and increasing customer satisfaction. Compact and convenient, the all-electric design and small footprint of the AirPouch FastWrap is ideal as a stand-alone system or combined with a variety of equipment accessories for any size pack station. The system operates at 65 linear feet per minute, and features operator-friendly controls and easy material changeover. The FastWrap system features state-of-the-art technology that ensures reliability and quality. A patent-pending dual belt drive and seal flattening system guarantee a wrinkle-free seal and better air retention. An intelligent design works in conjunction with user-defined settings, consistently managing heat, air and speed; producing high quality seals from start to stop. Wear items are positioned for easy access and an indicator light notifies the user of required maintenance. On-board system diagnostics and productivity data simplify serviceability. 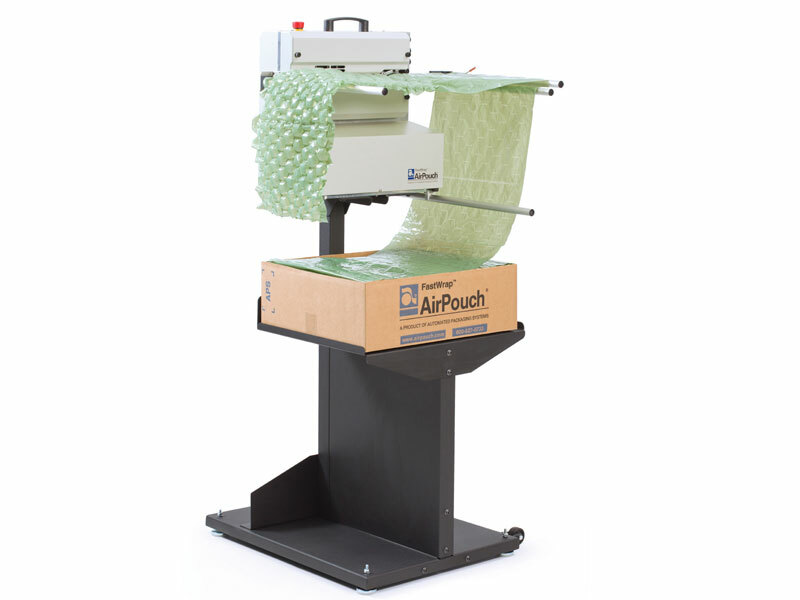 Plus, the AirPouch FastWrap on-demand protective packaging system features a knifeless design – eliminating the primary wear item found on other machines in its class. AirPouch FastWrap cushioning bubbles feature our patent-pending, channel-filled honeycomb design, which allows multi-direction wrapping and improved product protection. FastWrap block-and-brace tubes feature our patented EZ-Tear™ Perforations between each tube, making them easier to separate and reducing material waste. Both products are available in a variety of system-matched film types, including EarthAware™ Biodegradable and Recycled Films. The convenient, boxed material is easy to handle, and dramatically reduces the storage requirements found with paper, foam and pre-filled bundle bubble materials.